Do Invertebrates have Cognitive Abilities? What is Associated with What in Classical Conditioning? How is the Starvation Signal Transmitted? What is Stressful for a Snail? Why Should Octopus Possess Social Learning Skills? What do the Vertical Lobes of Octopus and Cuttlefish Compute? Are the Octopus Vertical Lobe and its LTP Involved in Behavioral Learning and Memory? Extinction in Vertebrates and Honeybees: Conserved Behavior, Conserved Molecular Mechanisms, but Different Brains? Is Learning Involved in the Formation of the Nestmate Recognition Template? Understanding how memories are induced and maintained is one of the major outstanding questions in modern neuroscience. This is difficult to address in the mammalian brain due to its enormous complexity, and invertebrates offer major advantages for learning and memory studies because of their relative simplicity. Many important discoveries made in invertebrates have been found to be generally applicable to higher organisms, and the overarching theme of the proposed will be to integrate information from different levels of neural organization to help generate a complete account of learning and memory. 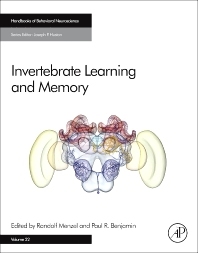 Edited by two leaders in the field, Invertebrate Learning and Memory will offer a current and comprehensive review, with chapters authored by experts in each topic. The volume will take a multidisciplinary approach, exploring behavioral, cellular, genetic, molecular, and computational investigations of memory. Coverage will include comparative cognition at the behavioral and mechanistic level, developments in concepts and methodologies that will underlie future advancements, and mechanistic examples from the most important vertebrate systems (nematodes, molluscs, and insects). Neuroscience researchers and graduate students with an interest in the neural control of cognitive behavior will benefit, as will as will those in the field of invertebrate learning.